On 16 October 1943, the German army tore 1,056 Jewish Italians from their homes, from their lives and loves, from their routine and familiar objects, and from their home city of Rome. The author of this book was not amongst them, because his father had prepared their flight. He was a Jewish boy of seven on the run and moving from house to house. He would never again see Rachel, the little girl who sat next to him at school. He was a `lucky` one, but as his story unfolds, it becomes clear just how harsh, lonely and terrifying that relative `luck` turned out to be. It took over sixty years for Renzo Modiano, a successful novelist, to write about this disturbing childhood experience. His school report issued in 1943, the twenty-first year of the short-lived `Fascist Era`, contains the contemptible bureaucratic classification `of Jewish race` immediately after his name. The enormity of this crime is known to us, but the day-to-day horrors and fears of being on the run from absurd and arbitrary legislation and diktat and also the kindness and solidarity shown by exceptional individuals are perhaps less known. Modiano's tale adds another dimension to Europe's most shameful moment, but it is also a call for us to remember and learn from history. Renzo Modiano was born in Rome in 1936. By the time he went to school in 1942, Jewish children were separated from the others, and the words, `Of Jewish race`, appeared in red after his name on his school report. In October 1943, he started the nine months on the run from the Nazi-Fascist authorities that are the subject of this book. Following the Liberation, he completed his education and graduated in Political Science from the Sapienza University in Rome. He worked as a journalist and on computer technology, but eventually decided that he was more interested in people than in bytes. He became a manager in the personnel department at Olivetti, and then the director of human resources at Mondadori. He is the author of four novels and the winner of the Dino del Bo literary prize. 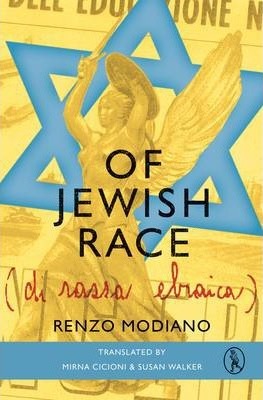 In 2006 he also won the Ultima Frontiera literary prize for Of Jewish Race, which is now also published in an edition for the Italian schools. He continues to work as a consultant, teacher and writer.